Sweet and salty fans unite! This week's Wedneday Treat Day was made just for you (and me!). 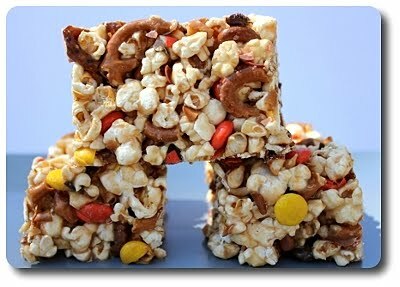 I've had these Chewy Caramel Popcorn and Pretzel Bars temping me every time I went sifting through recipes looking for the next treat we were going to make and finally gave in to their siren call. 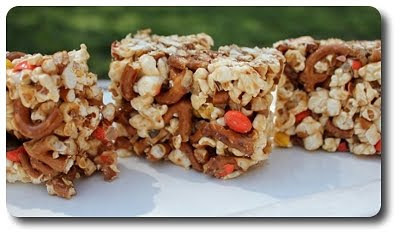 You'll need several cups of popcorn to make these - I had some loose kernels in the pantry, so I used the old-fashioned method of making it on the stove in a heavy pot. It took roughly 1/2 cup of the golden kernels to make the twelve cups called for - you could also use microwave popcorn if you like, popping two bags and measuring out the amount needed from both. 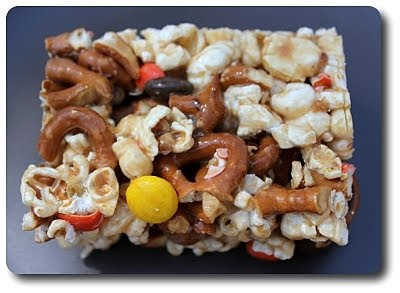 For a firmer salty crunch, a scant half pound of small pretzels, busted into irregular shapes, are tossed in with the popped corn, along with one additional ingredient that wasn't in the recipe. You could definitely stop here and end up with a smashing success, but we couldn't do that - Jeff made the suggestion to throw in one of my favorites candies - Reese's Pieces! Why? Well, both of us love peanut butter with pretzels, either as a dipper or stuffed inside those little hard nuggets - how could they not be wonderful here too? 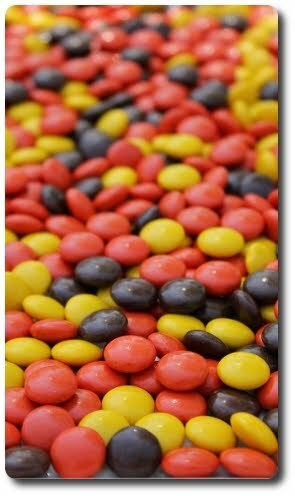 Besides, the nutty buttons would also add a splash of color... I was definitely game for that idea! I used a heavy handful, roughly around 1 cup. 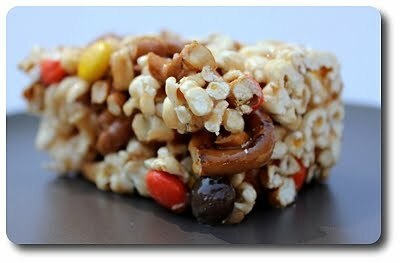 Sprinkling the candies directly on top once the mixture is in the pan would work, but placing them with the popcorn in the beginning gives an advantage - some of them will burst open from the heat of the caramel, exploding their now liquid-y peanut butter centers as you combine the ingredients together. The rest remain intact and will return to their crisp texture when the bars cool. 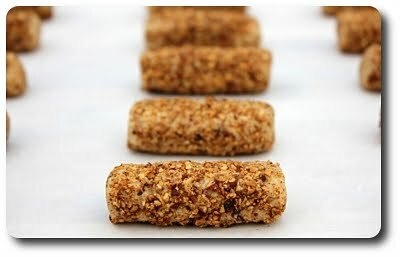 To package all those ingredients together into a solid bar, an intriguing version of caramel is made. Caramel may seem scary to make, but this "wet" version (as opposed to dry, where you wouldn't be adding water and can be more temperamental) doesn't have to be - all it takes is heating sugar with salt and splash of water, then allowing the syrup that forms to boil until it turns a golden amber color. You won't be stirring at all while this is happening, but if you notice the color is not happening evenly over the bottom of your pan, a gentle swirl or three helps to even the syrup out. At that point, a gradual stream of cream is added to stop the cooking process (be careful when you do this - the cream will cause the hot sugar to sputter a bit), followed by what I thought was one of the more interesting parts... a couple cups of miniature marshmallows! That last add-in was a first for me in caramel, but I could see where the recipe was going - the mallow will help keep the caramel more creamy and soft, while giving it strength to firm up as it cools. Before we get any farther, I do have a quick note about the caramel - as stated, the caramel at the amber stage will have a sweet, toffee-like flavor that we thought matched well with the ingredients - strong enough to notice, but not too potent that you can't taste anything else. However, if you prefer a richer depth to your caramel, take the color a bit darker before you add the cream and marshmallow. The original yield was 12 large bars, but Jeff and I thought these would be a bit too rich at that size and decided to pare them down to 16 instead. 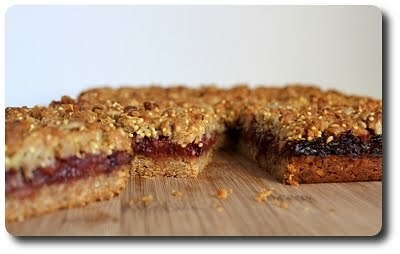 If you have an insane sweet and salty tooth (which, by the way, is accentuated with an optional sprinkling of salt at the end - I did this and will do it next time), then by all means, keep them in chunky, hunky monster squares and revel in their goodness! 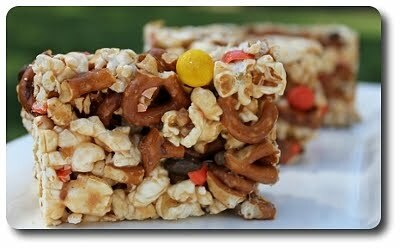 On the flip side, I could also easily see slicing the popcorn slab into 18 pieces, for a two or three bite treat. As you can see, the caramel sets enough to slice the bars well, but at the same time it is soft enough, giving this luscious, gooey quality to them that guilts you into licking the tacky caramel from your fingers after every bite. Guess who's joined the craziness! On Tuesday, we mentioned that we have been very busy a round here with some news to share. From the e-mail questions we got since that post, no, we are not moving again - at least, as far as I know. Please don't put any ideas in Jeff's head! We do, however, have a new addition to the household - meet Dora! 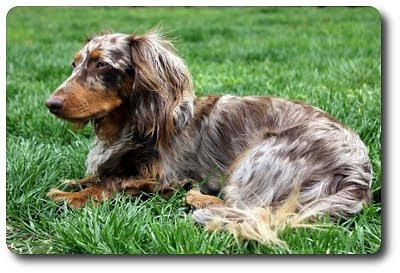 We got a call about this sweet girl late Friday night - she was owner surrendered to a kill shelter over in Raleigh, NC. A friend who works for a foster organization north of us let us know of her situation and we drove up an hour Saturday morning to see her - after walking in and seeing her happy self, we knew instantly she was going to be coming back home with us! 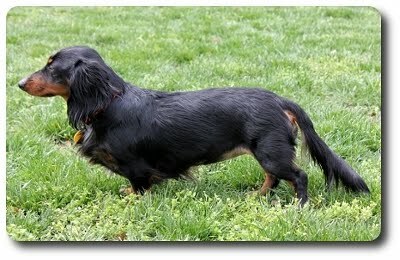 Sadly, we don't have any other information on her, other than she's about 2 or 3 years old. Our vet saw her Monday morning and said she looked great, but suggested we do around of blood work just to make sure there wasn't an underlying issue as to why she was given up. She did come with silvery painted toe nails, so we assume she was possibly in a home with children that no longer could take care of her (either not enough money or time) or she has some medical condition. 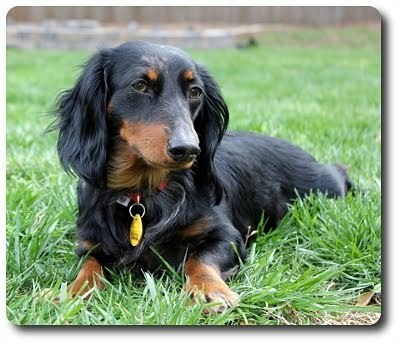 We've found her temperament pretty spot on with Gus's - laid back, not a barker, pretty playful and such a sweetheart! She hasn't shown any aggression towards other people, the random dog during our walks or even with her food. Now, of course, the question is, what does this dude think of her? He has taken quite an interest in her! 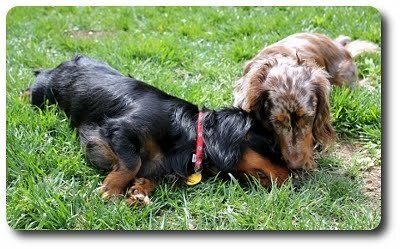 Playing around with friendly chasing parties and we've even seen an occasional snuggle on the couch or outside in the grass. We didn't know how he would react since he's been by himself for some time now, but apparently we had nothing to worry about! Although, I think he is trying to make up for lost time with the ladies, if you know what I mean... and yes, both of them are fixed. Since it has been a few years since we've had two dogs in the house, it's taking a bit of time to get into that routine again. Life sure is hopping around here now! For whatever reason she was given up, Jeff and I are happy that we found her and can give her a safe, loving home to spend the rest of her life in. 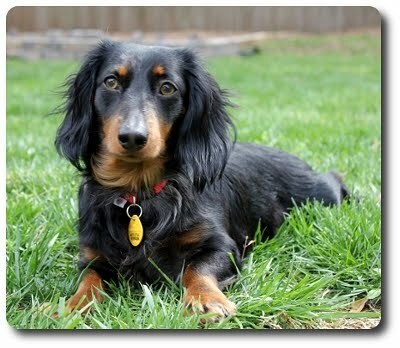 Welcome to your forever home, Dora! The past few days have been a bit hectic (more on this in a couple days... we have some news to share!) and we've been lucky to get anything on the table for either dinner or snacks. 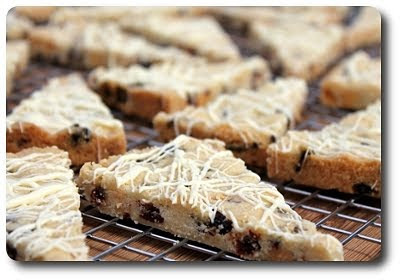 With the Weekly Wednesday Treat Day right around the corner, I knew I had to scrounge around enough time to get a treat made - I ended up going with these White Chocolate Cherry Shortbread. 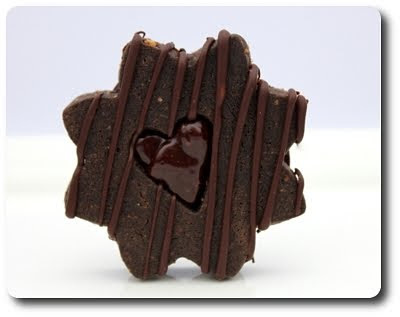 Do you know what I love best about shortbread? The simple ingredient list and non-laborious preparation! Plenty of butter (oh yeah! ), a few scoops of flour, salt, sugar and whatever add-ins to flavor it, which in this case was vanilla, dried cherries and white chocolate. Even though we were already using vanilla extract, I did up the ante by stealing a half cup of vanilla sugar from my precious jug I have brewing in the cabinet. The simple reason for this is I am infatuated with the combination of cherry and vanilla! If you don't have any, of course regular granulated sugar would be fine. When you add the dry ingredients into the creamed butter and vanilla sugar, just mix it until it looks like coarse crumbles - not combined or smooth at all. The reason for this is the cherries and white chocolate - it takes a bit of oomph to work the two into the stiff dough and you don't want to overwork it. These wedges have a wicked melt-in-your-mouth texture, with each bite landing a jackpot of cherries and white chocolate morsels - each piece was practically bursting at the seams with the two! I thought the sweet innuendo from the double burst of vanilla hit all the right spots, without stealing the spotlight away from either of the two stars. I was worried using both the scented sugar and extract may end up flowery, but thankfully that didn't happen! 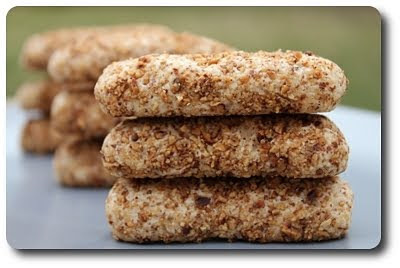 Between the sugar and white chocolate inside and on top of the wedges, I went with, and suggest you do the same, dried tart cherries for a nod towards balance - the cherries usually do have a bit of sugar added, but they still retain a pleasant sour note. 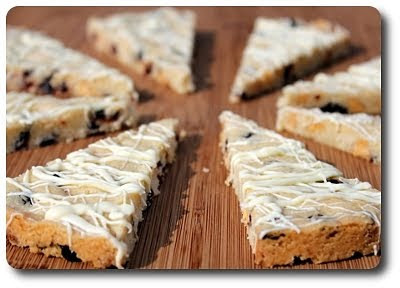 I used white chocolate chips (not "vanilla flavored" or "white baking chips") just because I prefer their creamier mouth-feel as they have actual cocoa butter inside, then chopped up a bar of quality white chocolate for the drizzle. If you do use the other types of chips, you may need to add a teaspoon or two of shortening when you melt them down for that drizzle. If you don't, the chips tend to either end up gloppy or too stiff to drizzle well. I do have one additional note - the directions were clear about pressing the dough into an ungreased baking pan, but I might suggest lining the pans with parchment paper. Of course, there is plenty of butter within the cookies and they didn't really "stick" per se, but they didn't just fall out of the pan either. With each round being cut while they are resting in the pans, that sheet of parchment may also give you a little protection from the tip of the knife. If you do line the pans, and are comfortable with the flipping process, I also might suggest you instead just flip the shortbread out onto a board and cut them there, saving your pan (and knife!) from being beaten up. I pulled out one of our favorite go-to biscuit recipes the other day to make for dinner the next night, but when I thought more about what we were going to be having them with, I decided to switch it up and try out these sturdier Herbed Asiago Rolls instead. If you were to look up the original recipe, you would notice the ingredients are pretty similar, yet the directions take a different turn. I've been using instant yeast for years - I buy them in two pound blocks, then store them in the deep freeze until I need to use the tiny granules. This yeast has the lovely benefit of not having to be activated by soaking in warm water first - all you need to do is whisk it right into the dry ingredients. If you'd rather use active-dry yeast, which is what the recipe called for to begin with, swish the yeast around in the warm water (not too hot now! You should be aiming for 100 to 110 degrees) called for, along with a tablespoon of the honey. Let the mixture sit for five to ten minutes - the yeast should start to look bubbly and a little foamy. If it doesn't, toss it away and try again - if it fails again, the yeast is more likely too old and you should find another batch. 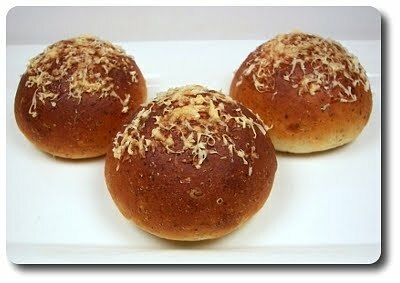 Oregano, basil, crushed fennel seeds and a touch of cayenne pepper make up the seasonings of choice in these speckled rolls, added right into the flour mixture before you begin needing. Also added to those ingredients? The shreds of Asiago cheese! Not all of the amount though, you'll see where the rest goes shortly. I love to feel the essence of the dough as it changes from a shaggy mess into a smooth, slightly tacky ball - however, you could just as well use a stand mixer if you like. Toss the ingredients into your mixing bowl and let the mixer rip, using the dough hook attachment - depending on your mixer, it will probably take 4 to 7 minutes or so on speed two or three. After the kneaded dough has rested and risen, the mass is whittled down into twelve portions, with each made into a tight ball - this is done simply by using slight pressure from the palm of your hands while rolling it on the countertop. If you find that the dough needs a little grip on the work surface to do this successfully, give the surface a light spritz with water and that should do the trick. 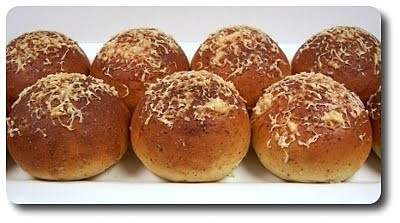 Arranged on a baking sheet and covered to rise once more, just before sliding the puffy dough balls into the a roaring oven, the rounds are topped off with a shower of the same cheese we kneaded inside. Taking less than twenty minutes to bake into golden browned rolls, as hard as it was, we did let them rest for another ten before grabbing a couple each. Soft, yet equally chewy with a cheesy crust, the robustness of the herbs was captivating and seemed to penetrate throughout every crumb. I had wondered if the cheese would melt into the background and fade away, but both of us found its sharp bite lingering on our tongue, making its presence known and enjoyed. 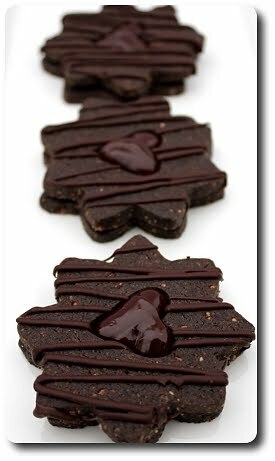 If you have extra time, you could prepare these a couple weeks ahead of time - let them cool completely, set them in the freezer until they are frozen and then wrap them up tightly. Let them thaw at room temperature and you are good to go! You could rewarm them if you like by wrapping them in foil and tossing 'em in a heated oven for 5 to 10 minutes, but the few we froze and thawed were well received left at room temperature. More cookies for the Weekly Wednesday Treat Day! 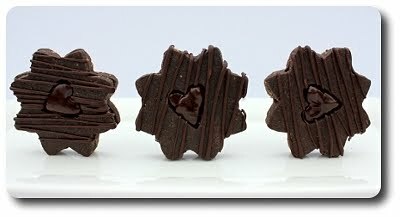 This time, we made these exquisite flower-shaped Double-Chocolate Sandwich Cookies. 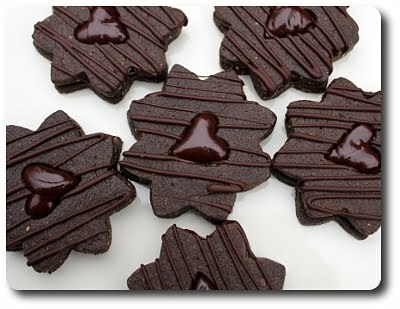 While this recipe was labeled double-chocolate, there are actually a few types used - Dutch-process cocoa powder in the rich cookie dough and a drizzle of melted bittersweet on top of the cookies, along with dark and milk chocolate in the filling. 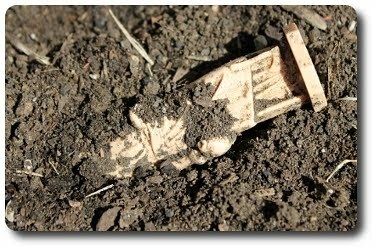 Bittersweet (sometimes closer to semi-sweet, depending on brand) and dark chocolate can be fairly similar - we used a bittersweet that was around 62% cocoa, while the bar of dark was just over 70%. You will notice in the ingredient list that I called for "ground toasted almonds" - I used whole almonds that I first toasted, then cooled completely and whirled them around in the bowl of our food processor. You can use already ground almonds if you have them handy and toast them or not - I wanted the nuttiness of the almonds to stand up to par against the chocolate, rather than get lost in the background. Besides those almonds to perk up the dark dough, a hint of cinnamon and a small scoop of instant espresso power are mixed in. This duo should be not as upfront as those almonds though - the cinnamon is very subtle, while the espresso powder is only there to heighten the chocolate and not give it a coffee flavor. You will need to work with the dough well chilled before rolling, then give the cut-out shapes a trip through the freezer to firm back up before baking - be sure to plan enough time for these steps. We used a flower shaped cutter (hello Spring! ), but of course use whatever shape suits your fancy. After the cookies have been baked and cooled, the ones with the punched-out centers (couldn't resist using a heart for this!) are drizzled with the melted bittersweet chocolate, then left alone to set. While they rested, the silky smooth ganache filling was made using the two chocolates mentioned above, a generous splash of cream, a nob of butter for shine and a small pinch of salt. Make the filling as soon as you intend to use it to slather over the bottom halves of the cookie sandwiches - it is easier to maneuver while warm (it will set as it cools) and will help anchor the top halves as they cement together. Two crisp, but not too crunchy, dark cookies, with an outrageous chocolate filling in between, these sandwiches are a chocolate lover's dream in a tidy hand-held package - will you be able to stop at just one? I know I couldn't! 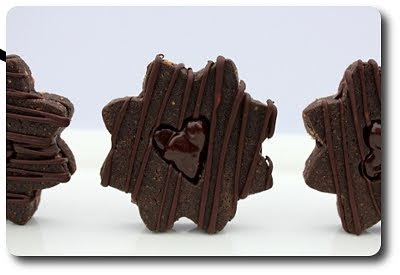 The ganache centers may even be stiff enough that if you placed a lollipop stick in the middle while sandwiching, you could "plant" these in a pot for a swanky presentation - I didn't test this though! I'll be honest, I don't have any introductions, stories or any fun reason to talk about why we made this Spinach, Green Onion and Smoked Gouda Quiche for dinner the other night. I pulled out the recipe simply because I was in a hurry and didn't have time to fuss over what to make this week! Usually I try to sit down and spend a half hour or so every weekend and pick out the menu for the week, but it was unfortunately not a luxury I could afford this past Saturday. 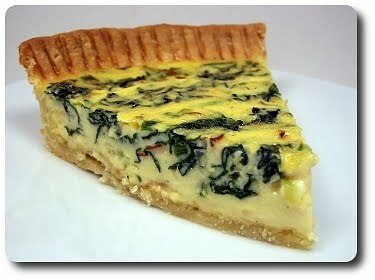 The crust is fairly unique for this quiche - not so much the ingredients, but how it comes together. It also has a few steps to it, so be aware of all the extra time needed. For a typical pastry crust, you'd be mashing, with either your fingers, food processor, a pastry blender or even a fork, several tablespoons of butter (or maybe even lard if your feeling especially frisky) into a mixture of flour and salt. This recipe calls for soft butter, a splash of milk and an egg yolk - nontraditional (or not very), yes, but it is a bit lighter. You'll see that you need to blend the milk and egg yolk together, then add them both very gradually into the butter - don't dump it all in at once or you'll be left with a chunky mess. Pouring it in a tablespoon at a time won't break the butter and you'll be left with a smooth, creamy base. With the flour added, and mixed enough to just barely combine, the dough will need to chill for about an hour before using it. With the dough cold, but not rock hard, it rolled like a dream for us without any cracking or patching needed. Once fit it into the dish, do note that it has sit in the freezer for several minutes before baking. Why? The butter needs to firm back up after being bashed with the rolling pin - it also helps the crust stay in its intended place. This way, you won't be screaming in horror as you watch the sides of the dough slide down the edge of the pan through the oven door. Into the baked, cooled crust (and be sure to let it get lightly browned all over before you pull it out of the oven) went the filling of sautéed green onions cooked with a clove of garlic and a generous amount of fresh baby spinach. That combination is then added into a bowl of milk (half-and-half would make for a richer result if you feel the need, but we felt regular milk was fine), eggs, smoked Gouda cheese and a pinch of freshly grated nutmeg. 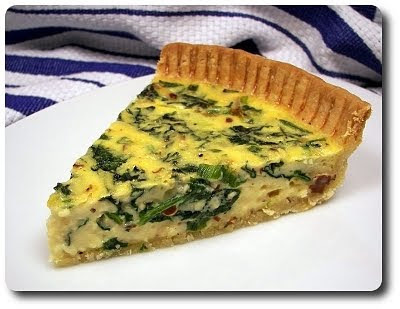 Please don't switch out the Gouda for cheddar or even Swiss cheese - the intensity and bite of the smoky cheese brings this quiche to life. You can somewhat control the texture of this - if you want the finished dish to be creamier (or maybe even a better way to describe would be custard-y), take it out at the time called for. If, however, you wanted a firmer, almost buoyant texture, leave it in an extra five minutes. It won't dry the filling out by any means, but will produce a more set result. Jeff and I both thought this was excellent, especially considering it is not nearly as laden with fat as you may expect with a quiche - in fact, Jeff has already asked that we put this on the list to make again. 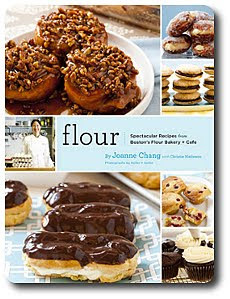 For my birthday last Wednesday, one gift I unwrapped from Jeff was a book I've had on my wish list for some time - Flour: Spectacular Recipes from Boston's Flour Bakery + Cafe. Apparently my not-so-subtle hints I gave when we were at a local bookstore were enough for Jeff to take notice. I started flipping though it immediately, flagging recipes with little notes that I knew I had to try straight away. While browsing, I was quite pleased to see the book offers both gram and volume measurements - even for liquid ingredients like water and cream! Score! I will be writing out the recipes from this book this way as well. I wish more authors would push hard to get their editors to include this, but I digress. 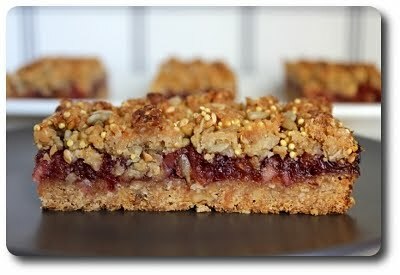 The first recipe I chose to make were these Granola Bars with Chunky Jam for the Weekly Wednesday Treat Day. 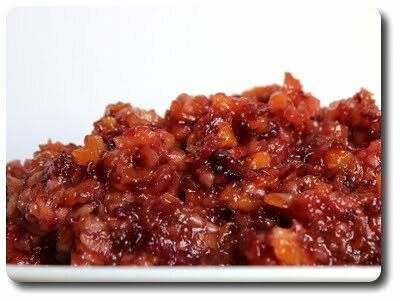 To not have to worry about the correct season for the fruit or quality of what is in the market at the time, the glistening chunky jam (though one might consider this closer to a compote than jam) is actually derived from a trio dried fruit! In this case, they were dried apples, cranberries and tangy apricots, brought to a boil with a scoop of sugar, a couple cups of water and a pinch of salt. It won't need to cook much - as soon as the water boils, the pot is taken off the heat and left to cool down while the fruit plumps in the sweet syrup. Before using, the fruit is scooped into a food processor and blitzed a few times - keep is chunky and loose, rather than going for a smooth consistency. You can make the jam ahead of time if you wish - keep it covered in the refrigerator (no more than 4 or 5 days), then let it hang out at room temperature while you start on the base. Toasted walnuts, flour, hearty old-fashioned rolled oats (no instant or quick cooking please! 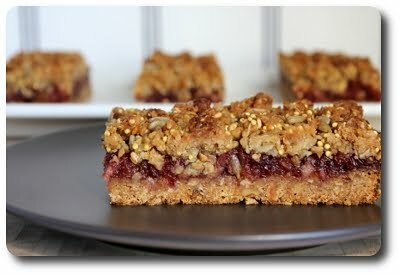 ), brown sugar, coconut, cinnamon and several pats of softened butter create not only the bottom of these bars, but the streusel-like craggly topping. Don't be alarmed after buzzing these ingredients together in the food processor to find that it is dry and won't hold together much. Transferred to a bowl, the floury mixture quickly transforms into a dough when you drizzle several tablespoons of sticky honey over the top and use one of the best tools available to mix it in - your hands! Could you just do that in the processor? Perhaps, but you risk overworking and heating the mixture up - besides, it's fun to get a little messy in the kitchen! Two-thirds of this is pressed over the bottom of the baking pan - I found it a touch sticky, but it didn't take much effort to get it to a level base. If you have troubles, lay a piece of plastic wrap over the top and then press it in - the plastic will peel right off without lifting back any of the base. To give the bottom a head start, the pan is baked, naked, until the top is evenly golden. A thick layer of the homemade jam concoction is spread over the top, followed by the rest of the base mixture, which was held in the refrigerator during the first bake. However, before sprinkling the chunky bits on top, a trilogy of add ins was stirred in for an intriguing crunchy finish - sunflower seeds, flax seeds and a few scoops of millet. In the oven for another bake, this one will take quite a while - up to an hour as you're looking for the bumpy top to be well golden. 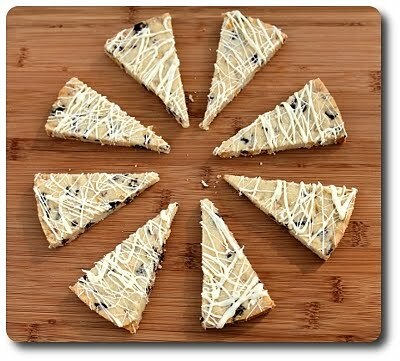 You can slice these into a dozen mammoth bakery-sized rectangles, but after we took the pictures, we decided to cut each in half for a more manageable daytime treat. The author, Joanne, suggests that these taste best after a couple days of sitting around. 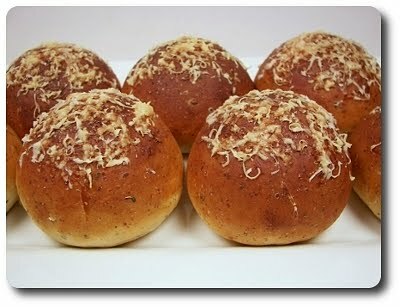 We decided to test that theory by making these on Monday, but waiting to bring them into work on Wednesday morning. We sliced off a chunk to nibble on after it had cooled enough and were very pleased right off the bat. 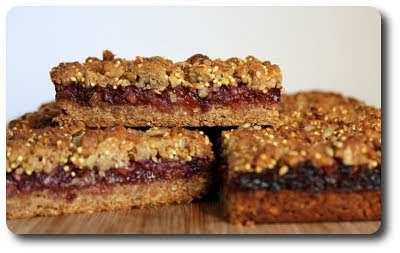 When we tried them late Tuesday afternoon for a pre-dinner snack, I could see what she meant - the fruity flavor in the jam was more prominent and the bars had an fascinating nutty wholesomeness, without being too "oat-y". They were also just as moist, if not a touch more so, on day two than they were on day one - if kept in an airtight container, the bars should stay fresh, kept at room temperature, for about a week! 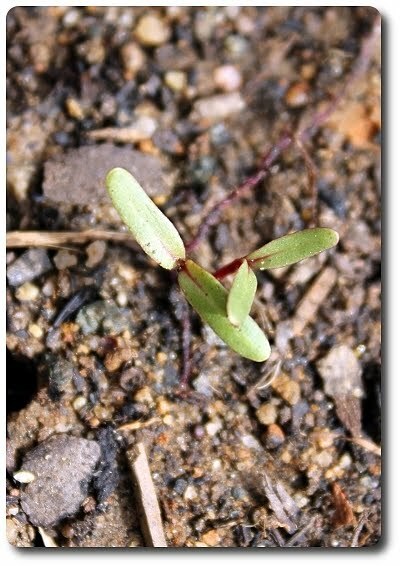 Our 2011 garden... so far! We've mentioned in passing a few times now about the garden we had hoped to put in the backyard since we moved out here to Charlotte. We finally got our act together this year and made it happen! We put the plan in motion last fall, marking out four spaces and building the boxes - this gave us a jump start and drive we needed to get it done early! 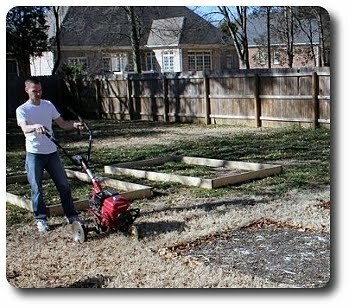 To make this go easier (not to mention, much quicker), we rented a husky tiller and went to town tearing our plots up! We, meaning me, because Jeff hasn't been cleared to do much work after his surgery - he decided to hang out and take pictures. Here are the beds all worked up and ready to go! 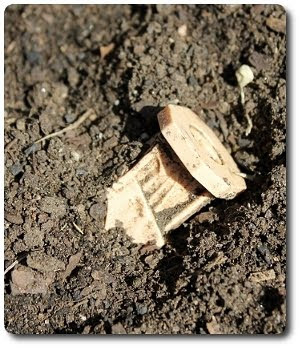 We did come across one surprise while getting our garden area ready - Jeff saw this first, then called me over. We knew exactly what this was going to be! 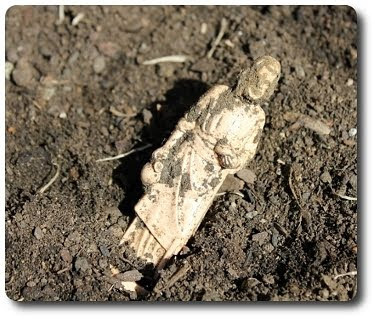 Apparently the previous owners buried one of those St. Joseph statues in hopes of selling the house quickly! We've been tempted to do this in the past when a couple of our former homes took a while to sell, but never ended up doing it. I hope this doesn't bring us a bout of bad luck! Back to the garden. In our first bed, we planted a row of spinach - they are just about ready to to be thinned out. I think we'll try and place some of the thinnings in pots for a bit of edible greenery around the back patio. Sitting next to the spinach is lettuce - we may have been a little over zealous with the minuscule seeds though. I need to get one of those handy seed spreaders for better control! 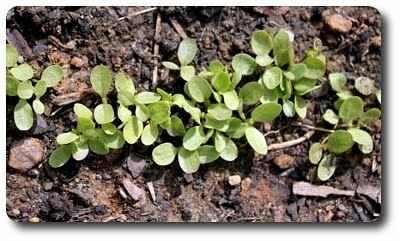 The final row in this box is Swiss chard - these took a few extra days to peek out from the soil, so they are just beginning their journey. In the second box, we've only gotten one row plated so far - kale! I'm excited to see how these turn out as this is our first time with them. I think a selection of our most used herbs will end up in the remaining spots in this bed. 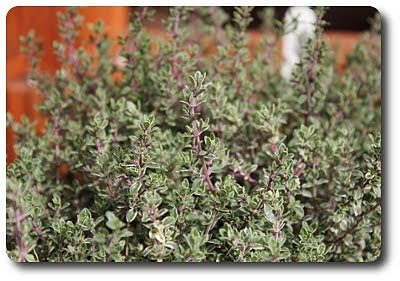 Speak of herbs, we randomly planted a thyme plant last fall we picked up at the farmers' market. I ignored it when it started getting cold, thinking it would die off and we would replace it in the spring. However, guess what jumped back to life with vigor when the warmth started? 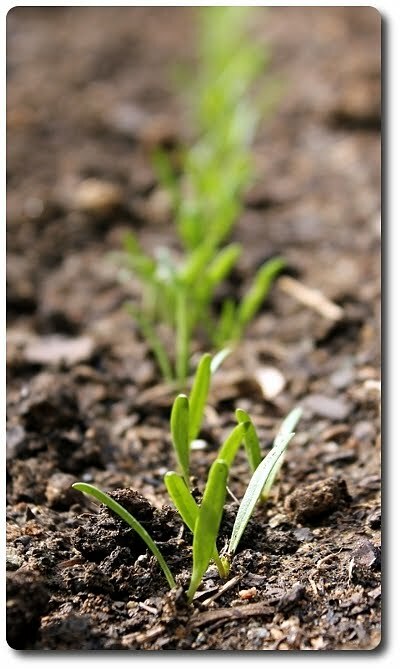 The third box has nothing to show as we just planted carrots and two types of potatoes - we'll do another update soon and hopefully they will be included! 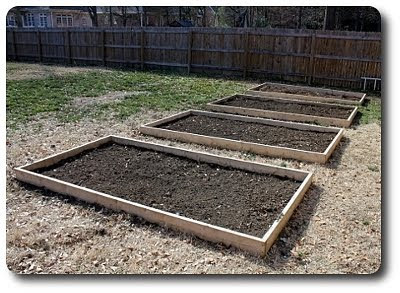 The last bed will be for tomatoes, perhaps peppers and a row or three of sugar snaps - it will be a few weeks before we plant the tomatoes, but our plan is to get the peas in tomorrow. 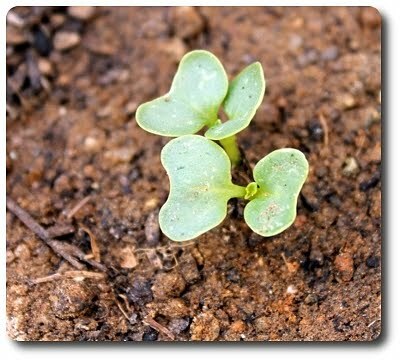 Here's to a bountiful garden in 2011! We're back with another cookie for treat day, but this one is very different from last week's crazy crumbled Oreo cookie-in-a-cookie. 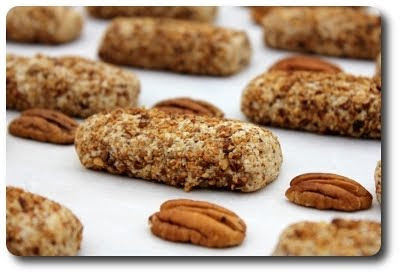 The ingredient list for these Pecan Logs may seem unpretentious with no fancy or unique requests, but how they are prepared and come together make these cookies distinct and exceptional. Before your eyes go wide when you get to the amount of salt called for in the dough, let me assure you it is correct. I do want to note that I only use kosher salt (unless otherwise specified) in all our recipes, with the brand being Morton kosher. You have to remember both the butter and all of the nuts are unsalted - you need a suitable punch to not only balance the sweetness, but accentuate the subtle notes in the cookies. Neither of us found the baked cookies overly "salty" at all. After preparing the manageable dough, I did play around with the directions from the original recipe, going in the reverse order that what was stated. 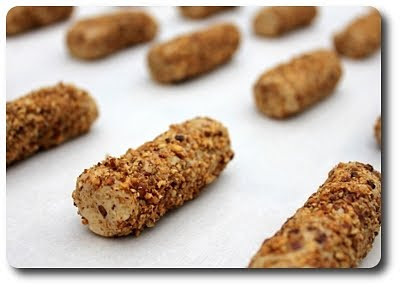 Instead of chilling the dough right out of the mixer, I scooped out balls using a tablespoon cookie scoop, shaped each into log between the palm of my hands, then took each fat roll for a ride though a pool of ground toasted pecans. I did this because while the dough was soft and slightly tacky, it wasn't sticky or hard to work with - I thought if the dough was too firm, the pecans may not stick as well. The cookies will still need to be refrigerated before baking though - chilling the butter in the dough will help the cookies keep their tidy shape, rather than spreading too much and flattening out. A half hour was good enough, leaving you enough time to turn the oven on and heat up! To tell when these cookies ready to be pulled from the oven, look for them to be a pale golden color and the tops have taken on a few small cracks. The logs are tender and a bit crumbly, with a tantalizing melt-in-your-mouth quality that made us both take note. 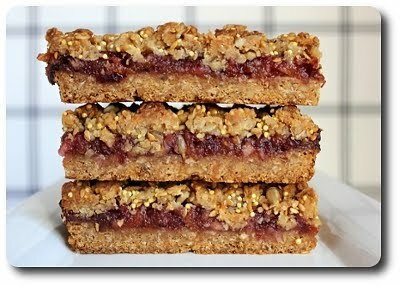 I thought they were reminiscent of shortbread, but not as dense or delicate. Being infiltrated by those toasted pecans, both inside and out, they are quite nutty as you would expect, which is what these cookies are all about - but what I think I appreciate most was how understated the sweetness was. If you feel like they need to by gussied up, give them a steady dusting of confectioners' sugar right before serving. I do have to say I agree with what Jeff said after he ate a couple of these nutty logs - these cookies will definitely be a contender for this years Holiday Baking Spree list! I imagine they will be a good candidate for a make-ahead cookie as well - either shaped, baked and frozen, or shaped and rolled in the nuts, then frozen. I do wonder- how do you pronounce pecans? Do you follow the pee-in-a-can line of thinking, or do you go with puh-cahn? Oh and just for the record, I say the latter.